Daytona Beach liegt an der Ostküste von Florida direkt am Atlantik . Unzählige grosse Hotelketten aber auch kleinere Motels stehen dichtgedrängt am Strand. Die üblichen Attraktionen sind auch hier die Pier, Musikpavillon und Amphitheater, doch der Hauptanziehungspunkt ist zweifellos der Daytona International Speedway. Zwei sehenswerte Museen haben sich in Daytona angesiedelt, einmal das Museum of Arts and Sciences und die Dow Gallery of American Art. Daytona Beach hat einen internationalen Flughafen. Nach Daytona Beach kommt man auf der I-95 aus südlicher und nördlicher Richtung. Der Interstate-Highway 4 verläuft von Tampa aus westlicher Richtung direkt nach Daytona-Beach. Eine Bahnstation gibt es in DeLand etwa 30 km westlich. Conch House, 700 North Atlantic Ave. Phone: +1 386 255-3411, Toll Free: +1-800 584-3017 . Lou-Ray Motel 400 South Atlantic Ave., Phone: +1 386 253-7202. .
Royal Beach Motel, 1601 South Atlantic Ave., Phone: +1 386 255-8341 . Saxony Inn 35 South Ocean Avenue, Phone: +1 386 252-4703, Toll Free: +1 800 584-3017 . 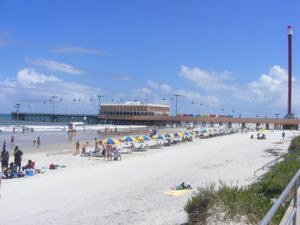 Seaside Inn, 500 North Atlantic Avenue, Phone: (386) 253-2562 . Sunny Shore Resort, 2037 South Atlantic Ave., (toll-free: 1-800-329-8662), . Super 8 Oceanfront 133 South Ocean Avenue, Toll Free: +1 800 584-3017 . Acapulco Hotel and Resort, 2505 South Atlantic Ave., +1 386 761-2210 (toll-free: 1-800-329-8662), . Beachside Plaza Resort, 3309 South Atlantic Ave., +1 386 760-1403 (toll-free: 1-800-329-8662), . Bermuda House 2560 North Atlantic Ave., Phone: (386) 672-1440, Toll Free: 1(800) 584-3017. . Boardwalk Inn & Suites, 301 South Atlantic Ave., +1 386 253-8300, Fax: +1 386 255-8277, . Fountain Beach Resort, 313 South Atlantic Ave., +1 386 255-7491, Fax: +1 386 255-6667, . Holiday Inn Express and Suites, 3301 South Atlantic Ave, +1 386 767-1711, . Islander Resort, 3161 South Atlantic Ave, (toll-free: 1-800-329-8662), . La Playa Resort, 2500 North Atlantic Ave., +1 386 672-0990, . Mayan Inn, 103 South Ocean Avenue, +1 386 252-2378, Toll-free: +1 800 448-2286 . Plaza Ocean Club, 640 North Atlantic Ave., +1 386 239-9800, . Courtyard Daytona Beach, 1605 Richard Petty Blvd., +1 386 255-3388, Fax: +1 386 255-3391, . Holiday Inn Express, 2620 Int'l Speedway Boulevard, +1 386 258-6333, . Holiday Inn Hotel & Suites, 930 North Atlantic Ave., +1 386 255-5494, . Residence Inn Daytona Beach, 1725 Richard Petty Blvd, +1 386 252-3949, Fax: +1 386 252-2725, . Surfside Hotel, 3209 South Atlantic Ave, +1 386 761-2050 (toll-free: 1-800-329-8662), . Plaza Resort and Spa, 600 North Atlantic Ave., +1 386 255-4471, . Diese Seite wurde zuletzt am 7. April 2017 um 16:49 Uhr bearbeitet.